Under The CoConut Tree An Bang Beacher HOI AN HOMESTAY. Come to relax and unwind in one of our beautiful bamboo huts tucked away amongst the trees. Visitors can enjoy the beauty of our home stay. Love this place! I really felt like I was on vacation. Everybody was super chill, the food was excellent and cheap. I'd stay here again if I ever go back. The staff was so accommodating and everybody who stays here seems to be on the same wavelength. It was very easy to make friends if you are traveling solo. A little piece of paradise! Absolutely loved the people, the vibe and the staff there. They have a private beach, a superb restaurant and the vibe is amazing. If you are looking for a place to rest, this is where you go to! Love, love, love this place. The staff are amazing, especially Jake and his sass. The facilities are brilliant. I love the showers. You walk to the beach from the hostel. It’s a little tropical paradise, and I actually met some amazing people here. And getting to play with the Harry Potter theme named puppies every day was everything. Brought such a smile to my face! Big love to Under the Coconut Tree! Booked a private room and it was so very spacious. Thankfully, it had a mosquito net cause I’m prone to getting bitten and it protected me from a huge cockroach. It has a direct pathway to An Bang beach and close to many restaurants. If you also like dogs you’ll want to stay here because there are some cute dogs there. Loved this place. A hidden gem with a calm, relaxing atmosphere. Had great sleep even though I was in the dorm. Showers were powerful. Beach was an Ideal get away with food/drink service to your deck chair! Staff were friendly and professional. Grab bike to town was about 23000 Dong so not complaining about the distance. 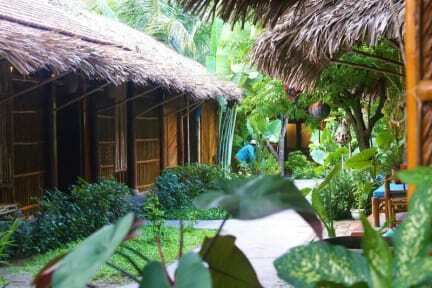 Nice and cute hostel by the beach in Hoi An. Beach area is nice and chilled, but you will need a scooter or bicycle to get into the old town. Dorms are great and fans works perfectly - no need for AC. Food is fine and not overpriced. Would recommend for a few days in Hoi An, as a supplement to the town.